How low does this go before there’s a currency crisis? In our modern monetary system, the term ‘fiat currency’ refers to this absurd notion of paper currency that is conjured out of thin air by central bankers and backed by nothing but hollow promises. Or in this case… ‘let there be paper money,’ which pretty much crystalized the absurdity of our monetary system. And he was right. Central bankers can change interest rates whenever they want. If you think about it, interest rates are nothing more than the ‘price’ of money. It’s the rate that people pay when they ‘demand’ money in the form of loans based on the supply of money available. But this price of money is incredibly influential around the world. Interest rates affect the prices of shares in the stock market. Oil. Agricultural commodities. Real estate. Automobiles. Almost everything we touch is affected by interest rates. So in setting the price of money, we have given central bankers the power to effectively set the price of… everything. Make no mistake, this is a form of price controls. And there’s not a doubt in my mind that one day (probably soon), future historians are going to look back and wonder how so many people could be bamboozled. We have somehow been conned into believing that the path to prosperity is for the grand wizards of the financial system to conjure paper currency out of thin air. Yet this notion of ‘money backed by nothing’ is an absurd fantasy that has failed every single time it has ever been tried before in history. I bring this up because I want to share a chart with you that I presented yesterday to a savvy group of investors. Bear in mind first that a central bank, like any bank or business, has both assets and liabilities. 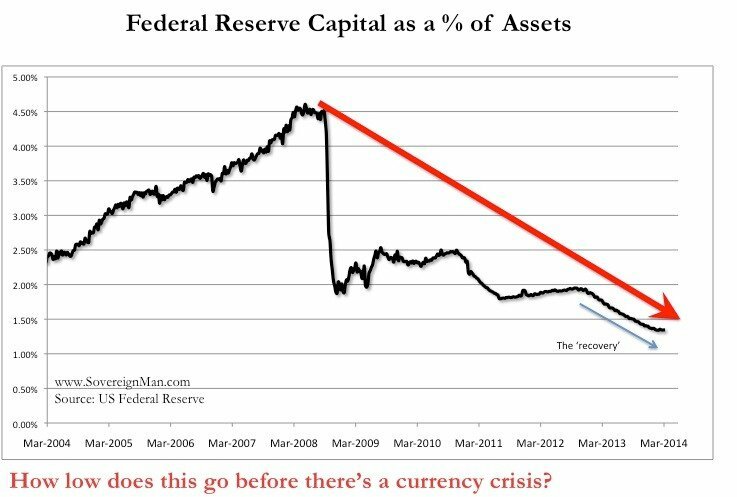 Central bank assets are things like gold and government bonds (e.g. US government Treasuries). Central bank liabilities are the ‘notes’ that they issue. And if you’re wondering what a central bank ‘note’ is, just look in your wallet. If you’re in the US, those aren’t dollars. The dollar was defined by the Coinage Act of 1792 as 416 grains of standard silver. Rather, you’ll see the paper in your pocket says “Federal Reserve Note”– a liability of the US central bank. The difference between assets and liabilities is called equity, or the bank’s capital. And well-capitalized banks maintain substantial capital as a percentage of their assets. You could think about this as a margin of safety. The less ‘capital cushion’ a bank has as a percentage of its assets, the less it will be able to withstand shocks to the system. I tracked this data for the US Federal Reserve. And as the chart below shows, there has been an astounding decline in the Fed’s ‘margin of safety’ over the last few years. The lower this line goes, the more the Fed gets pushed into insolvency. Note that the trend levels out in early 2012, only to start another steep decline a few months later just as they told us the economy had ‘recovered’. This is apparently what recovery looks like. The question I ask is: how low does this go before there’s a currency crisis?